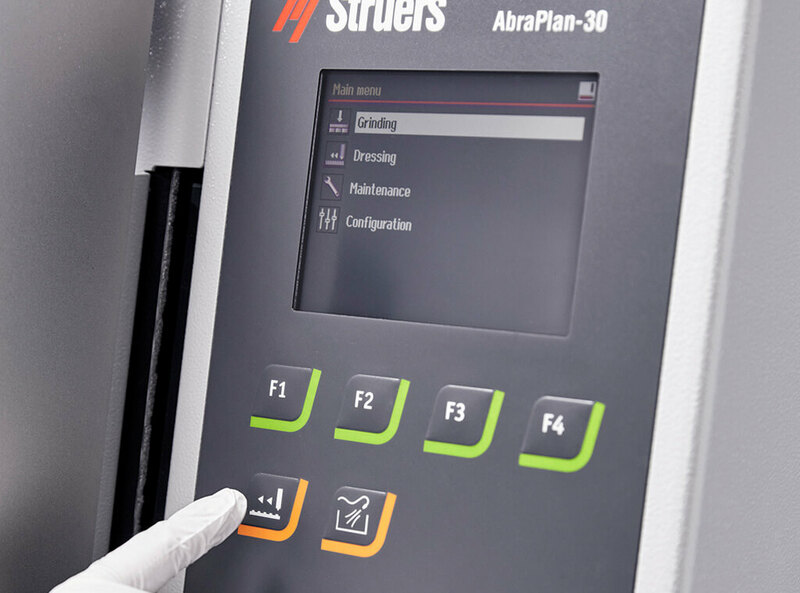 AbraPlan-30 brings a wide array of features and benefits, enabling users to optimize their grinding process to save time and consumables. 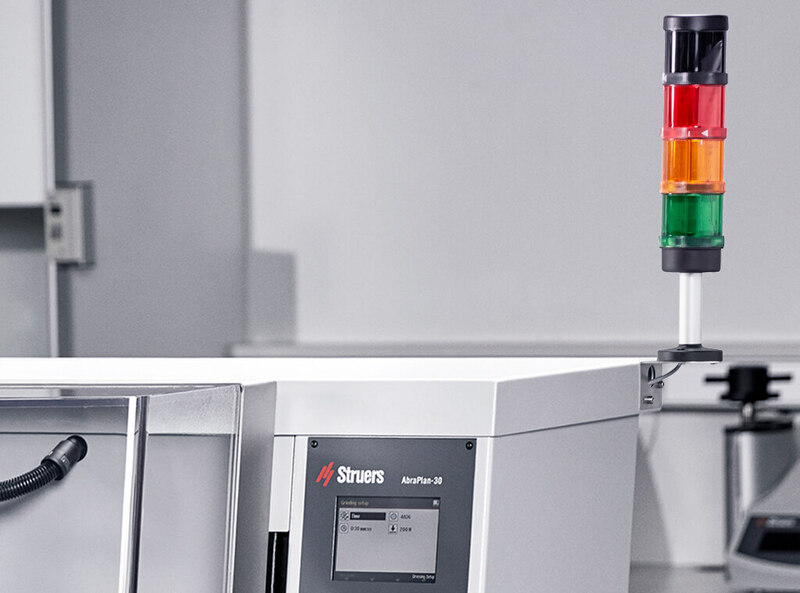 The strongest high-speed plane grinding machine available on the materialographic market, the powerful AbraPlan-30 is ideal for laboratories or workplaces carrying out testing of large specimens or a high volume of specimens. The automatic diamond dresser keeps the grinding stone plane and sharp and the automatic surface search function makes the dresser process fast and simple. A special dresser key on the front panel enables easy access to dress the stone any time. 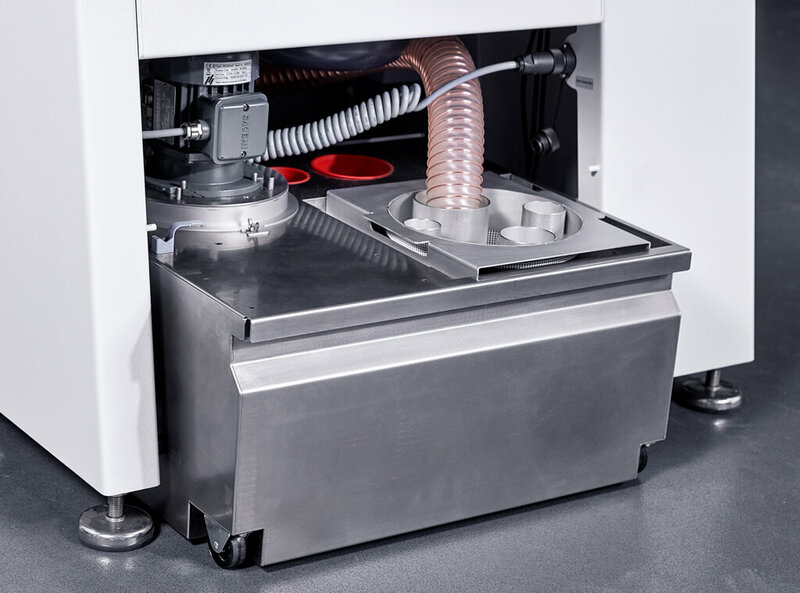 The dresser automatically monitors the remaining thickness of the grinding stone at start-up and informs the user when the stone has to be replaced. The large icons give the user a fast and clear overview on the colour display and the multipurpose turn/push knob makes navigation uncomplicated. The performance of the grinding stone, the material removal rate, is monitored continuously and showed on a graph, which helps the operator optimize the process. AbraPlan-30 offers an exceptionally stable and robust design with an extremely solid frame for precision grinding and powerful motors. The design limits vibrations, which is necessary when plane grinding at high-speed using high force. An automatic diamond dresser keeps the grinding stone plane and sharp for optimum performance and precise results. 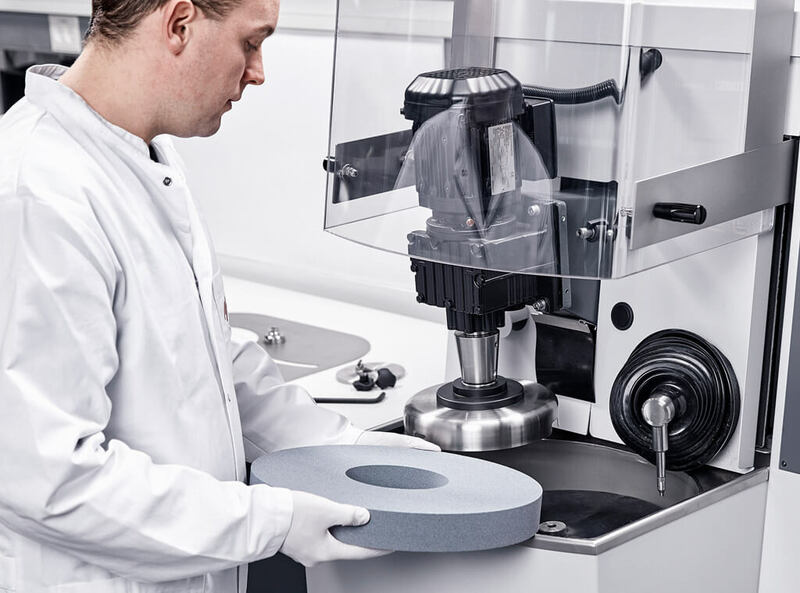 The performance of the grinding stone is monitored continuously, and as soon as the removal is reduced below a pre-defined level, the stone is dressed. Thus guaranteeing the best possible performance of AbraPlan-30 and a perfect surface quality of the ground specimens. The grinding stone rotates at 1,450 rpm, ensuring a very high material removal. The accurate material removal sensor allows you to pre-set the amount of material that needs to be removed. 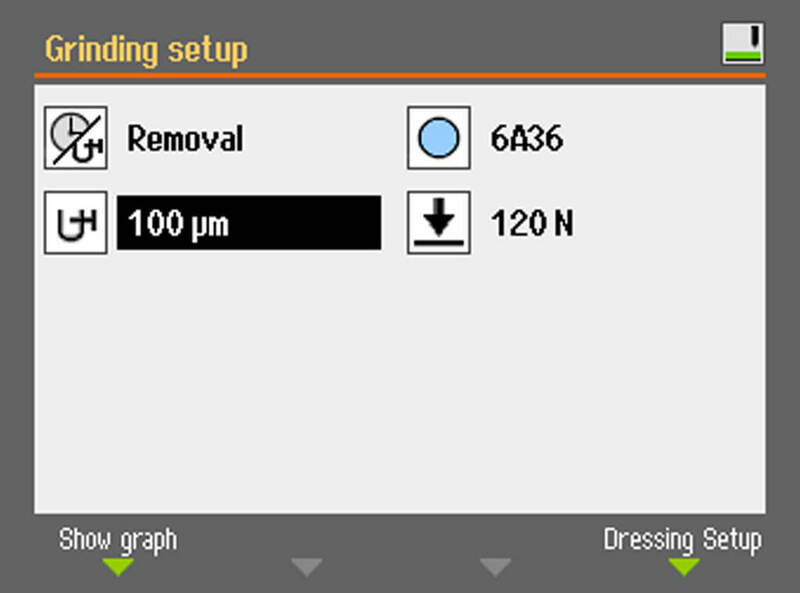 The removal can be set from 0.05 mm to 10.00 mm in increments of 10 μm. 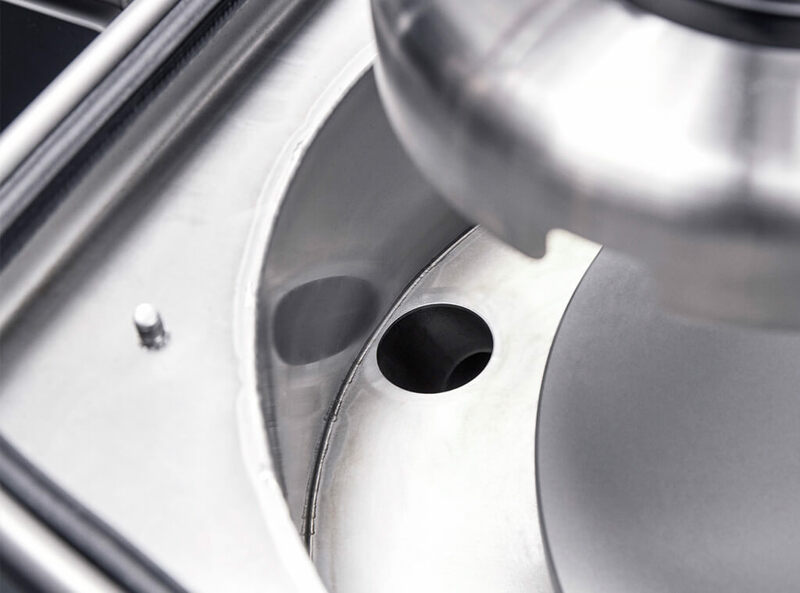 A high-quality surface finish is achieved quickly with typical grinding times of 20-30 seconds. 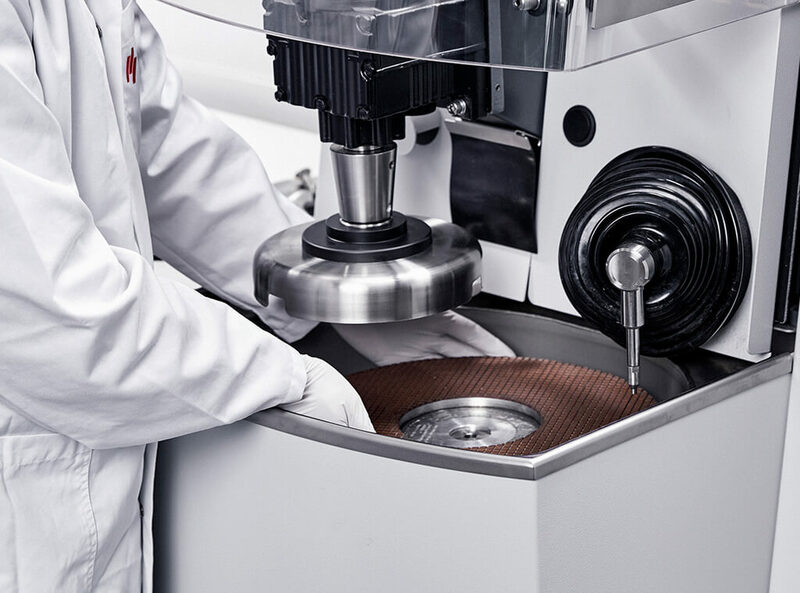 Specimen planeness and reproducibility are unmatched on the materialographic market, saving time on the subsequent fine grinding or polishing steps. The graph shows the material removal rate on the specimens and when the stone is dressed during the grinding process. The graph makes it easy to see whether the dresser parameter is set optimally or, in connection with manual dressing, when it is time to dress the stone. This makes it easy to improve time and stone consumption. 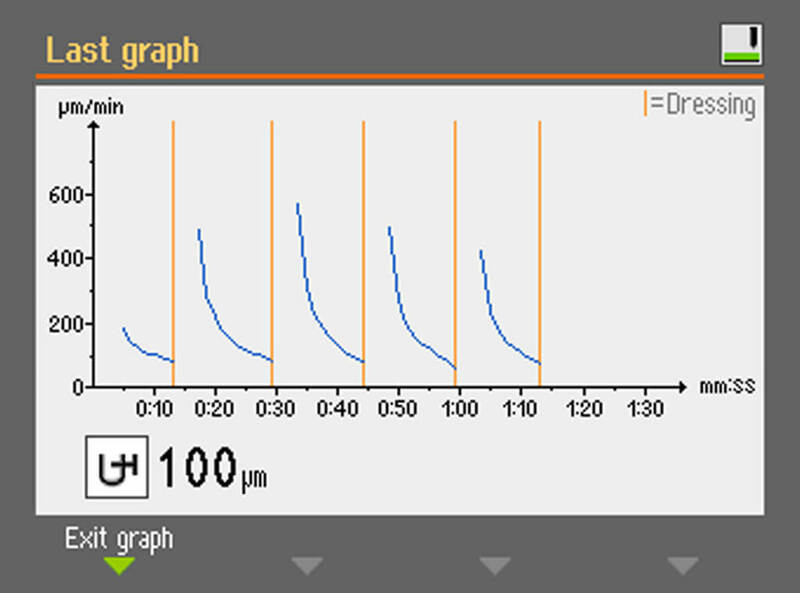 AbraPlan-30 has a special function to obtain maximum precision for saving time on next preparation step. 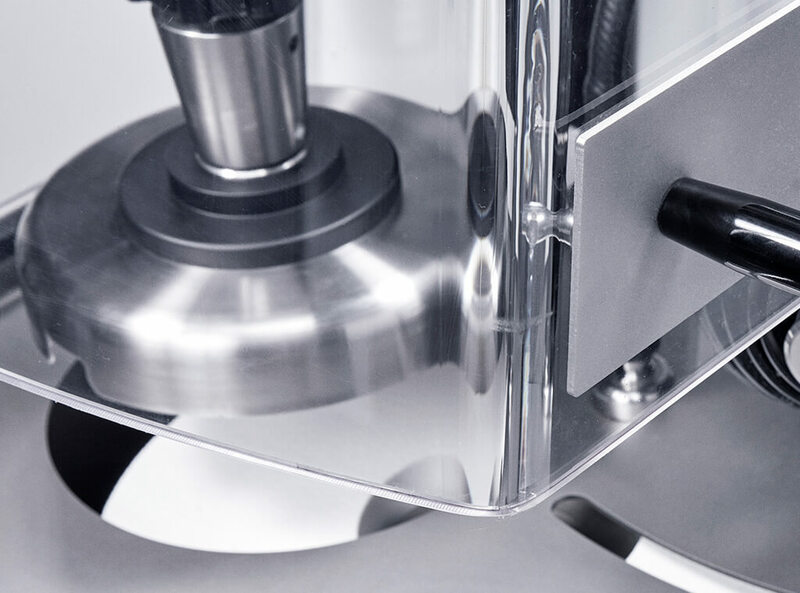 Working with low tolerances, the small influences from the deflection when pressing the specimen holder against the stone, can be reduced by using Improved accuracy. Using Improved accuracy the 0-point for the removal measurement is measured before starting the grinding when the stone is not rotating. This makes removal measurement more accurate. The stone on AbraPlan-30 rotates at 1450 rpm and a lost specimen can therefore damage the bowl. To avoid breaking the bowl we have decided to produce it in a corrosion resistant high-quality stainless steel for greatest strength and safety. To underline quality, it comes with a lifetime corrosion warranty on breakthrough corrosion. A recirculation cooling unit must be connected for cost-efficient water utilization and to collect removed abrasives. Struers recirculation unit is integrated into the machine with easy access for maintenance and control of the cooling water. The three phases recirculation pump is connected directly to the AbraPlan-30 resulting in that the emergency stop also controls the recirculation pump. Different types of materials require different types of grinding stones and to cover the wide range of materials we have developed a variety of grinding stones. There are Aluminium oxide and Silicon carbide stones for normal and hardened steels, as well as for soft and ductile materials. 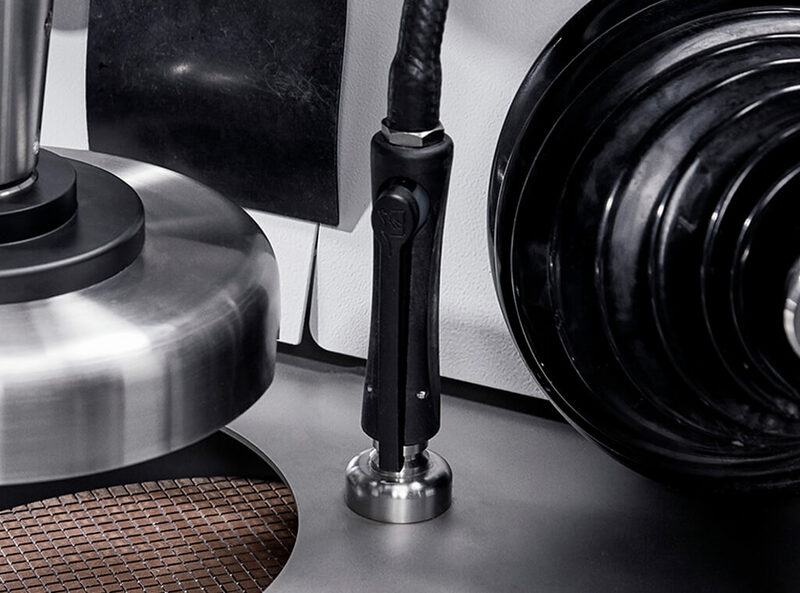 For extremely hard materials like sintered carbides or ceramics, we even have a diamond grinding disc. Plane grinding of very hard and brittle materials such as tungsten and sintered carbides is often a challenge. It takes a long time and wears the grinding surface much faster than expected. Using a Diamond grinding disc on AbraPlan can be the solution both to lower the time significantly and to reduce consumable cost. To secure a long lifetime of the AbraPlan-30 we recommend keeping the machine clean by a frequent maintenance. A built-in flushing gun makes cleaning of the grinding area fast and easy just using the recirculation water. The large 50 mm/2" dia. outlet and drain tube with a smooth inner surface secure that the grinding water does not clog up in the bowl. The outlet in the bowl can easily be cleaned using a brush/bottle-brush without risking to push the drain tube away from the outlet. AbraPlan-30 is designed with the highest level of operator safety in mind. 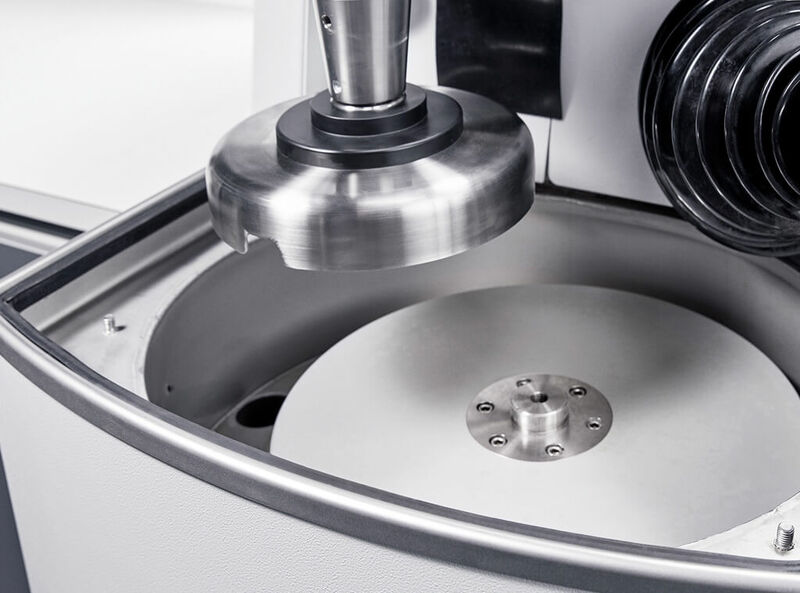 The grinding stone and specimen holder are completely encapsulated in stainless steel covers, eliminating the risk of incorrectly clamped specimens flying out. The entire working area is encapsulated by a transparent safety cover, preventing accidental access to rotating parts. The machine cannot be started before the safety cover is closed, and can only be opened again when the machine has stopped. AbraPlan-30 is very easy to operate, making extensive training unnecessary. A large display with large icons gives the operator a clear overview of process parameters. A new stone icon enables fast recognition of the stone status – dressed or used surface. The multipurpose turn/push knob makes navigation easy and a countdown feature allows the operator to see the remaining grinding time or remaining material to be removed. A beacon can help the operator to monitor the actual working condition from a long distance. The different colour lamps on the beacon can be set up individually to give the operator exactly the status information he requires. Advanced semi-automatic machine for plane grinding of specimens in specimen holders up to 200 mm/8” dia. AbraPlan-30 features an automatic diamond dresser with automatic surface detection, a removal rate sensor, and a transparent safety cover. Recirculation cooling tank, pump and filter, grinding stones, and specimen holders are available separately.